Whether you’re a kitchen newbie, or a home cooking pro, there are some kitchen essentials which every home should have. These are the tools that will make it easier for you to prepare and cook delicious meals at home. The most essential equipment you should invest in is a good quality knife. 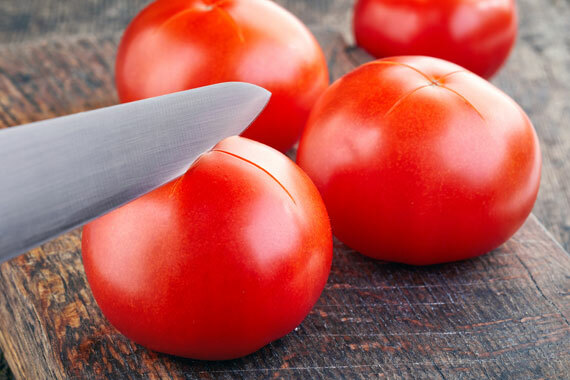 Of all the options available, a quality 12-inch chef’s knife is the most versatile type – useful for almost any chopping task. When buying a knife, it’s important to get one with a rigid blade and comfortable balanced handle. Check how it feels when you’re holding it. We recommend a mid-range Victorinox like this Chef’s 12″ Blade; it’s well balanced, has a comfortable handle and is super easy to maintain. If you could have only one pan (and just to be clear, we think that’s a silly idea :-), we suggest getting non-stick. They’re easy to use and will help give a uniform distribution of heat, which makes cooking faster. When you’re looking for a quality pan, first check that it has a thick bottom and a sturdy handle. We recommend this 11” Swiss Diamond Pan with Lid that has high edges that allow for more versatile uses. One of the most useful kitchen essentials is a box grater. A box grater is an easy way to quickly prepare ingredients. It’s best to invest in a quality grater, something that will last infinitely longer than a $2 special from Coles. Your grater should have a strong metal construction, it should have sharp and deep grater holes, and should have at least 2 size of grating/shredding holes. We recommend the 5 in 1 Microplane Box Grater. Having the right equipment is going to speed up you cooking, make your ingredients more consistent, and give you confidence in the kitchen. Happy cooking! Have you ever skipped a meal? You’re not alone! 56% percent of Australians say they regularly skip 1-3 meals a week. And what’s the reason we’re skipping meals? The key reason people give is that they are too busy, or have overslept. Although we are skipping meals, we don’t want our family to miss out. According to Melanie McGrice, one of Australia’s leading dieticians, it’s still important for us to have our family sitting around the table eating together. Despite this desire, because of busy schedules and a lack of meal planning, the way many Australian families eat has changed. Unfortunately, the classic family dinner is becoming less common. Your mood can be affected when you skip meals. When your brain is not well fed, your mood changes, you can become more irritable and foggy. You’re also more likely to get crazy food cravings that you can’t resist, making you eat more next time. You might think that if you skip a meal you’ll lose weight, yep it’s proven, but there’s a catch. You’ll most likely drop weight in the short term, but eventually gain back dangerous belly fat, because when you skip meals, those lost kilos are from your muscles, not fat (Ohio State University, 2012). There are some advantages in skipping meals, but losing weight isn’t one of them. We’ve all been there: losing weight is the number one priority, however, skipping meals is not the answer. For starters, it might cause your blood sugar levels to dive. Sugar is fuel for your body, and if the body doesn’t get the proper amount, your whole body will not function well. Your metabolism slows, and the next food you eat isn’t burned efficiently. Our suggestion? Don’t skip your meals. Eat regularly, eat food that will sustain your body with energy throughout the day. Remember, having a healthy body and mind has a healthy heart ♥. Sweet potatoes, also known as kumera, are originally from Central and South America and have been cultivated for at least 10,000 years. Our ancient ancestors where definitely on to something and modern science has revealed that sweet potato is packed with potassium, Vitamins A and C, is high in calcium and highly digestible. While the most commonly available type is orange, sweet potatoes also come in white, yellow, pink, and purple. The orange and yellow types contain the most vitamin A, while the purple variety has the highest rates of antioxidants. Its name and sweet taste is thanks to enzymes that convert most of its starches into sugar as the potato matures. Moreover, its sweetness continuous to increase during storage and when they are cooked. In Western Australia, sweet potatoes are grown all year. Despite this, most sweet potatoes sold and consumed are actually imported from Queensland (they grow most the countries supply). There are 3 key growing regions in WA, each with different harvest months. Carnarvon is best between December and February, as well as August and September. Broome has good supply from December to March and the Perth area has a short but awesome harvest window from February to March and May to June. Sweet potatoes take 4-5 months to develop which makes them a relatively long-term investment for our local growers. We work with our partners at the Canning Vale market to source the best sweet potato from the WA region that is producing the sweetest and best produce at the time. When cooking, the great news is that sweet potato doesn’t take long to prepare. Additionally, cooking them will help maximise the nutritional value. Simply cutting it into ½ inch slices and steaming for about 7 minutes is enough to bring out their fantastic flavour. 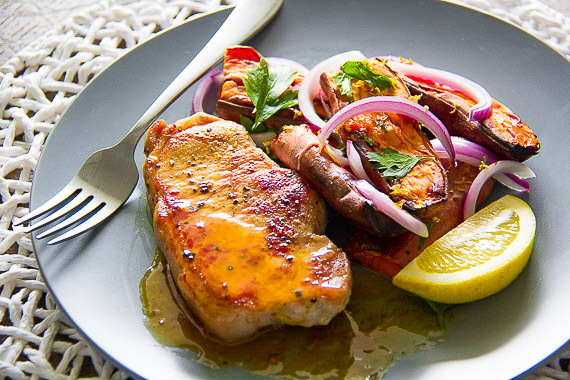 For an exciting way to try sweet potatoes, read our Seared Pork Loin Chops with Roasted Sweet Potato Salad – It’s fantastic! Researches from Oregon State University uncovered evidence to suggest that in ancient Roman and ancient Egypt, mushrooms were reserved for royal families. The theory is that there was a belief mushrooms heralded super-human strength. This belief from Ancient times is not without merit. We now know that all mushrooms, including the common white button mushroom, assist in removing excess oestrogen circulating in our body. Published medical studies have linked this property with significantly reduced breast cancer cell growth and reproduction. They may not be super-human, but ancient and modern scientists agree that Mushrooms sure can help in maintaining a healthy body. For cooking, mushroom are used in dishes because of their distinct flavours and an ability to blend well with other flavours. 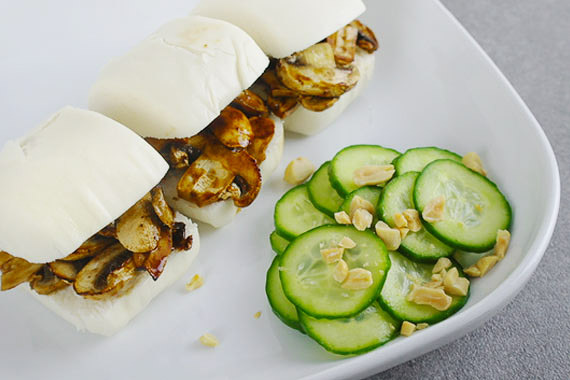 For a new and different way of using mushrooms, our Char Siu Mushroom Buns are a fantastic way to get more mushrooms in your life. Zucchini, also called “courgette”, originated from the Americas but became extremely popular in Italy and it was there in the warm Mediterranean soil that the Zucchini we know and love was first grown. Zucchini is commercially available in a few different styles, including yellow and green. Also available are the flowers, making it one of only a few ingredients where almost all the parts are edible; including the flesh, seeds, skin and flower. Zucchini is low in calories, which is fantastic if you are keeping an eye on your weight, yet it still contains important nutrients to support a healthy lifestyle. High levels of vitamin C help to maintain eye health and avoid sclerosis or easy bruising. Moreover, when eaten regularly, it can help in lowering your homocysteine levels that aid in the prevention of heart attacks, strokes and blood clots. Though classified as a fruit, zucchini is usually eaten as a vegetable because it is best when added to cooked dishes. 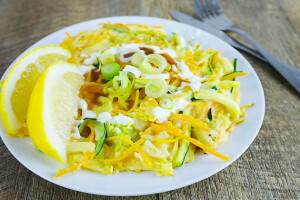 For an interesting way to include more Zucchini in your diet, try our Japanese Pancake (Okonomiyaki). A healthy kind of fat – Avocados are packed with monounsaturated and polyunsaturated fats. These are the type of fats the body needs and have been found to have significant positive health benefits. Because of a reputation for being high in fat, some of us avoid eating Avocado. While it is true that 77% of the calories in Avocado are from fat, not all fats are created equal and these fats are the good type. Some studies have shown that Avocado actually help in weight loss, and aid in lowering the risk of heart disease. Other research has also indicated that the fats found in Avocado can assist eyesight, reduce the risk of cancer and relieve the symptoms of arthritis. With a high fat content it’s only natural that Avocado can be used for cooking oil. Very similar to olive oil, the fats in Avocado help in resisting heat-induction oxidation, making Avocado oil healthy and safe in cooking. Avocados are also high in potassium and actually contain more than bananas. Potassium has been shown to reduce the risk of stroke by helping the body regulate a healthy blood pressure. Thanks to the climatic differences of growing regions, WA avocados are available all year round. However, the main commercial season runs from August through to February. Farro, also known as emmer, is one of the oldest wheat grains still being used. Popular in parts of Europe, it is often used as an ingredient in salads and soups. It has a subtle earthy flavour, and although prepared by cooking in water until soft, it retains a unique and delicious crunchiness. In addition to tasting delicious, Farro has a number of health benefits that justify using it more often in our cooking. As a wheat, Farro contains a high level of fibre, which is good for the heart. Fibre also helps in regulating your blood sugar and lowering cholesterol. Farro is high in vitamin B which can help to stabilise blood sugar and aids the regulation of cholesterol. With a low GI, Farro helps in maintaining high energy levels and it’s packed with goodies that help brain function so you can stay focused and feel full for longer. Farro can be difficult to buy in generic supermarkets, but it is grown right here in Australia and is available under several recognised brands. 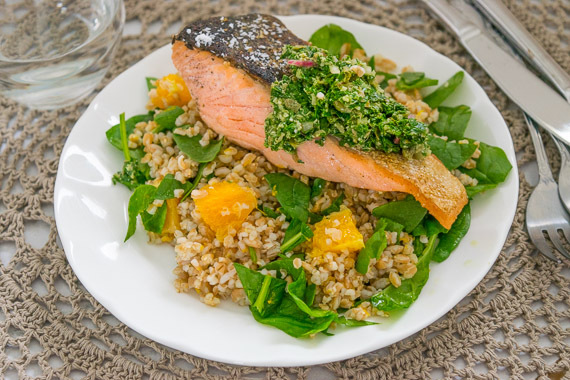 If you want something new but healthy, subscribe to this week’s recipe – Salmon Fillet with Salsa Verde and Orange, and Spinach and Farro Salad. A trend of the modern world is that quality home-cooked meals are being sacrificed because of long hours at work, inconvenient grocery stores, and the stress of planning what to eat. This trend has meant we are spending less time cooking and less time sharing kitchen experiences with with our family or friends. According to research conducted by Smart Beginnings, “Family is the single most important influence in a child’s life. Parents and family form a child’s first relationships”. It is in our family that our values and principles get nurtured and developed. Regular family meals provide opportunities for the family to develop better communication (Lyttle & Baugh, 2008). Therefore, it’s natural that a quality meal helps to build stronger family ties. For couples, doing an activity with your partner can help you both feel more connected and happier. You may even be surprised with your partner for helping to cook a healthy dish and share a new experience together. (Young, 2015). We shorten the preparation time in cooking delicious and healthy recipes because we portion ingredients and provide everything you need. With 20-35 minutes, your family can enjoy a quality meal while catching up after a long day at work or school. We love that feeling of excitement you get when serving a new and interesting meal at your dinner table. With different recipes each week, we help people to be motivated and try something new for their family or partner. We gather the freshest local ingredients from local suppliers and farmers. We provide unique ingredients that you haven’t tried before, and introduce new styles of cooking. Cooking is a very calming ritual. It’s a different kind of stress relief, but one that helps to take the mind away from the pressures of the day. Unfortunately, however, because of the stress involved with shopping and deciding what to cook, many simply never start. We know, from experience, that it is a stress when you have to think about what to cook or where to shop after work. 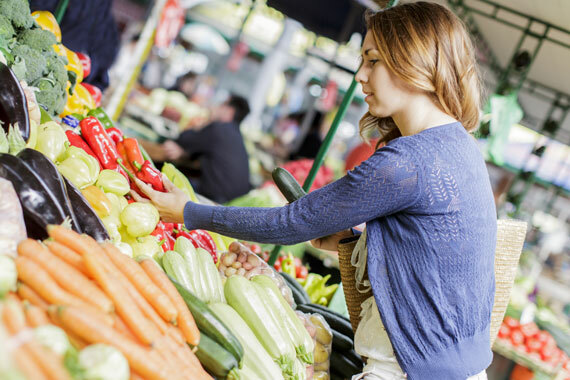 Picking up ingredients at the grocery store will eat-up your time for cooking or relaxing. We have worked hard to build a product that will reduce stress by delivering everything at your doorstep and lessen the burden of thinking about your meal plan. When the barriers to cooking are removed, you can enjoy the natural stress relief of cooking. For almost 2 years now, we’ve been designing and delivering easy and delicious recipe kits. It is our passion for sharing a quality meal pushed us to build a service that helps make cooking meals at home more convenient. We think you deserve a rest from grocery shopping, long queues and the hassle of meal planning. So you see, cooking at home can be easy, convenient and beneficial. All you need is the right tools, motivation, and of course You Plate It. Health fads will come and go, but some healthy eating ideas have stood the test of time – one of those is Salmon. Salmon is a fresh and healthy dinner option you can feel great about. In Australia, Salmon is expertly and sustainably farmed in Tasmania. There are some key advantages to locally farmed fish. Firstly, it will be fresher, secondly it will have a substantially lower carbon footprint than anything imported from Europe or North America, and finally, it is grown to strict Australian food standards so you can be sure you’re not eating anything dodgy. Protein: A mere 113g of salmon will contain roughly half of your daily protein goal. We cater about 150g per person, so that’s a lot of bang for your buck! The proteins found in Salmon are constructed from amino acids which help to build and maintain muscle mass as well as boost your metabolism. You can think of Salmon as a support system for all your hard work in the gym. Vitamins: Salmon is loaded with vitamins and minerals. There are high concentration of B vitamins that help you to stay energised. Vitamin D helps calcium absorption for healthy bone growth. Omega 3 Fatty Acids: Say what you want about fat, but not all fat is created equal. Some fats are our enemies, but many others, like EPA and DHA, are our friends. These are omega 3 fatty acids. According to numerous scientific studies, these fats help to maintain healthy joints & skin, reduce your risk of heart disease and aid in brain function. The important thing is that our body can’t make these fats and therefore we need to get them as part of our diet. Sure, the weekly price tag might seem a little steep at first, but when you consider how much buying everything for a new recipe would cost, the price is justified. We estimate a recipe subscription service like ours can save you 20% on your weekly shop (and that doesn’t include all the unnecessary purchases we make when shopping). You Plate It buys ingredients directly from farmers and in bulk from wholesalers and artisans, so we’re able to pass on savings to our customers. Plus, with each plate costing as little as $10.94, the price is less than even the most basic restaurant. A recipe kit service will save you time in three key areas: Firstly, in the time and effort it takes to research and plan meals; secondly, by reducing trips to the supermarket; and finally, packaging the ingredients required for a recipe will save time searching your pantry and fridge for ingredients. 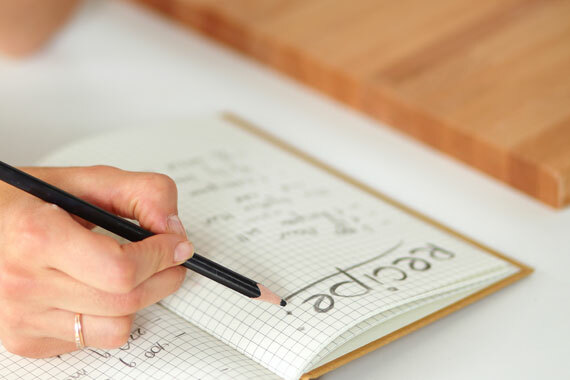 This makes a recipe kit service perfect for busy people, or people who value their time. 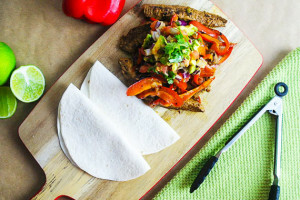 Although a recipe kit meals still requires cooking, even a kitchen novice can prepare a restaurant quality meal with fresh local ingredients in less than an hour. We all love to try new things right? A recipe kit is the perfect way to try a new recipe or a new ingredient. Because we source our ingredients from a depth of suppliers and farmers, we are able to provide unique ingredients – things you can’t find at Woolworths. The recipes are carefully designed to allow home cooks to use and combine ingredients in delicious and new ways. In a You Plate It recipe kit, you get the exact amount of an ingredient you need – no more jars of sauce going bad or spinach going limp in the fridge. This substantially reduces food waste as well as reducing packaging waste. Read here about how our compostable packaging is helping to reduce the plastic waste generated from a typical household grocery visit. We believe WA is home to the best fresh produce in the world, so we work hard with our suppliers to provide fresh local ingredients made or grown right here in Western Australia. We work closely with some of Perth’s finest fresh produce providers, like Mondo’s and Partridges, to ensure we supply a top quality product. Our commitment to working with WA farmers means you’ll be supporting local producers while getting a one-of-a-kind culinary experience!